Some people say that we tend to remember the good things in life and forget the bad ones. I think this is only partially true. Although I have many happy memories of my early life in Pontypool, I can also remember, quite vividly, the diseases that plagued us and also the unhappy accidents and even fatalities. One of my very early memories occurred when I was in Pontypool Town School Infants section. My aunt Phyl worked there at the time and she often came up to our house for her mid-day meal. I well remember her telling my parents about a gruesome accident that had occurred to one of the girls in the school. A hundred yards or so up the Bell Pitch from Town School was the Wesleyan Methodist Church. Prior to the war it had a line of railings about five or six feet high bordering the pavement. For reasons best known to her, the little girl had tried to climb the railings and managed to get right to the top; in fact her head was above the top of the railings. Suddenly her hands slipped and the spike at the top of one of the railings went up through the bottom of her mouth. Someone rescued her and took her back down to the school where some of the staff looked at her injury and decided she would have to go to the hospital. They asked my aunt Phyl to take her. I can’t remember any sequel to the accident so I imagine the girl recovered as I never heard anything further about it. The next accident, a year or so later, was much nearer to home. Next door to us at number 6 High Street lived the Palmer family. Their little girl, Jean, was a few years younger than I but I often talked to her over the wall. I remember, on one occasion, going into their house. 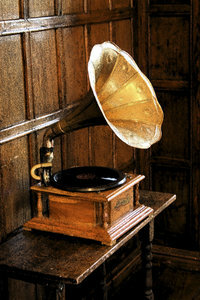 It was the only place I’ve ever seen one of the old gramophones with the large loudspeaker as used in the HMV adverts with the little dog. I can only remember one personal accident. It was very painful but not life threatening. One of the things we boys liked doing was making a bogey. This generally took the form of a short plank of wood with a pair of wheels at the front and another pair at the back. Old pram wheels were ideal for this. A few of us had made such a bogey and were trying it out on the slight gradient going from the end of Gwent Street down into Haden Street. There were three of us on the bogey on one occasion and, as we swung around the corner, I overbalanced and almost fell off. I put out my hand to steady myself and it dragged along the surface of the road tearing off some of my skin in a very painful manner. It took a while to heal and eventually ended up as a small septic sore on the side of my left hand. When it finally healed it left a small hole in my hand. I still bear the scar to this day. My friend, Eric Smith, had a girl friend when he was about ten or eleven. Her name was Rita. She lived in Slough but came down to Pontypool to spend some time in the summer holidays with her grandmother, who lived further down High Street, One Saturday he arranged to go to the cinema with her in the evening. In the afternoon he rode his bike down Gwent Street and planned to cycle around into the High Street hoping to see Rita. As he went around the corner a van was backing down High Street and it knocked Eric off his bike. He hit the ground with some force and the last thing he remembered before passing out was the van’s wheel coming towards his head. Some of the local people who lived in the small cottages behind the wall brought him round and took him home. As he was so shaken up his mother would not allow him out for the rest of the day. So Eric missed his date with Rita. The event which had the most devastating impact on me happened in my early teens and involved Jim Cleaves. I’ve written in previous posts about how much he did for the youth at Park Terrace Church. He was a commercial traveller and was one of the only two people I knew at that time who owned a car. One cold winter’s day he was on a journey up the valley to call on one of his customers. There were patches of ice on the road and, as he was driving through Abersychan, the wheels of his car hit a patch of ice and his car slid straight across the road into the path of an oncoming bus. Jim Cleaves died as a result. I was totally devastated to think that such a tragedy could befall someone I admired so much. He was greatly missed at Park Terrace Church. Illnesses of one sort or another seemed always to be with us and most of us at one time or another had measles, chicken pox, influenza, sore throats and a host of coughs and colds. I remember, when I was four years old, having pneumonia. This was way before antibiotics and all the other drugs that are freely available today, and my parents subsequently often told me that they thought they were going to lose me. Fortunately I pulled through, but I remember the long weeks I spent in bed and all the visitors who called with sweets etc to take away the taste of the medicine. A few years later when I was in standard one at Town School we had a scarlet fever epidemic. Children in the school were going down with it like ninepins. So it was necessary for all the children in the school to have swabs taken to try to ascertain the carrier. Consequently, one morning every class had to take turns lining up outside the staff room which was used as the surgery and, one by one, we went in to have our swabs taken. It was rather unpleasant having this cotton wool on the end of a wire pushed down our throats but mercifully it was fairly quick. After the swabs had been examined it was discovered that the carriers were twin girls who lived in a little cottage just behind Tottils’ sweet shop.